More and more people these days are getting pro-active with their health and keeping a journal of their blood pressure with a home automatic blood pressure monitor. Monitoring yourself and keep a record of the readings is really good for those who unfortunately suffer from high blood pressure, as you can provide your doctor that will be very helpful in their analysis of whether or not your current medication is working, as well as alerting you to any worrying changes of spikes before things get out of hand. While self-testing is by no means a substitute for regular checks by your physician, the NHS recommends testing with a home blood pressure machine as well because sometimes the anxiety caused by testing at the surgery or hospital can often affect the results. Therefore, if you or someone in your family suffers from high blood pressure, getting a home blood pressure kit is a no brainer. Easy to use and giving you clinically accurate readings, this home BMP monitor will give you fast readings from the comfort of your own home. Heart rate can be monitored too. It is very easy to use, and powers off automatically to save batteries, a set of which are included for good measure. What we really like about this one is that it has the option to store up to 90 previous readings for two people in the device, so you can easily track your blood pressure over a period of time. Best of all, you don’t have to worry about keeping a journal with this machine; just take it to your next medical appointment and let your doctor read the numbers. 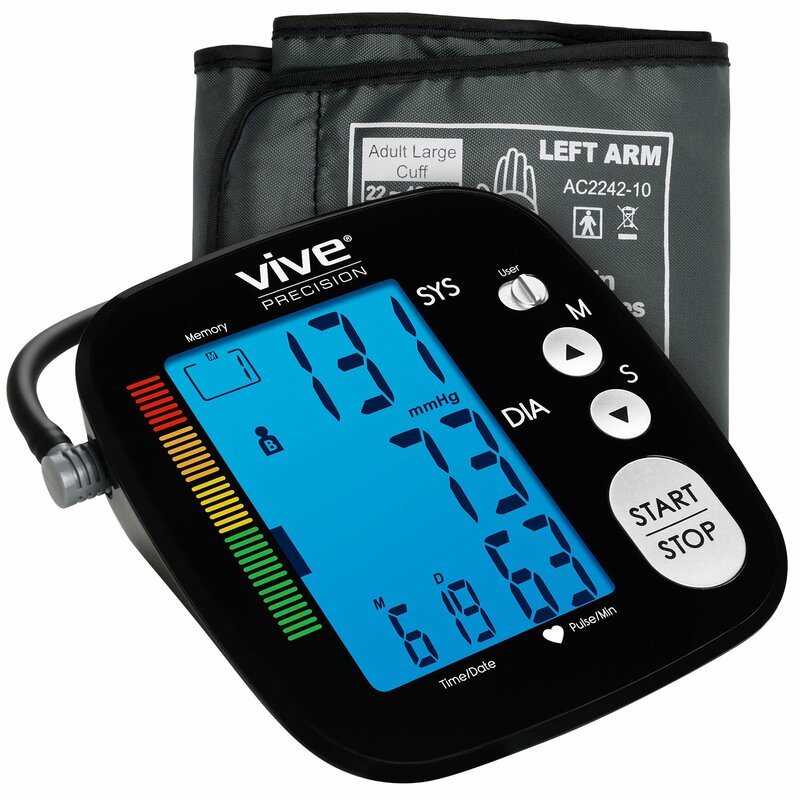 The Vive BPM monitor is a great home blood pressure kit that is affordable and very useful. Each kit is individually tested by the manufacturers to ensure that they are all up to standard. It comes with a very useful and illustrated manual, and is very user friendly as it only requires on button push to start the test. We also really like that this monitor can be set up to follow readings from two users, so you and another family member can both use it easily and track your readings. 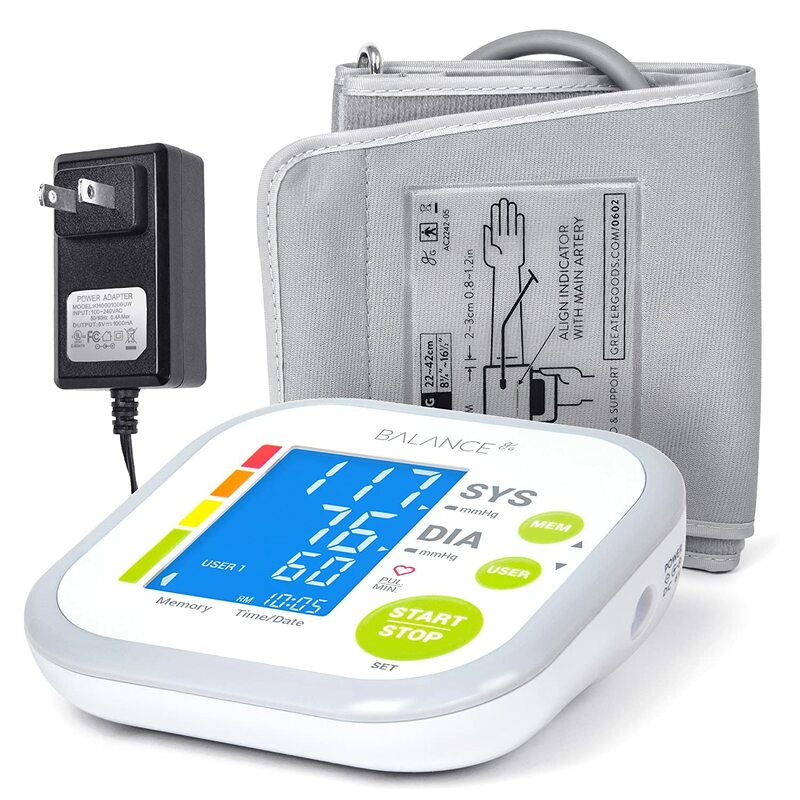 Get the peace of mind and very accurate readings with Balance’s home blood pressure machine. Just slip on the cuff and you’re ready to go. Balance makes a lot of home medical products which are known for their user-friendly designs and high-quality, and this is no exception. 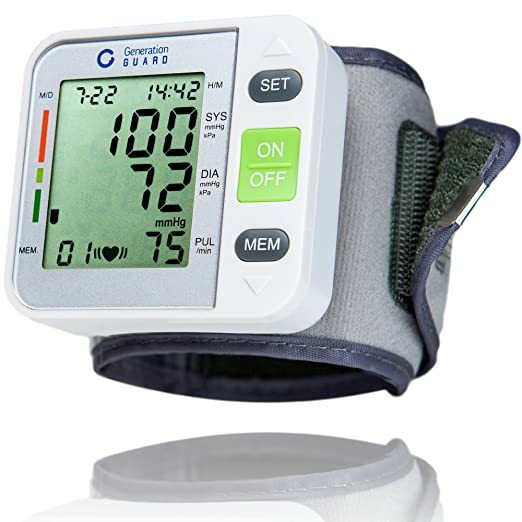 It monitors systolic and diastolic blood pressure as well as pulse, and it has a Hypertension indicator bar and irregular heartbeat sensor alert you to any issues. Batteries are also included which is always nice. You can also find video tutorials showing how to use the machine on the official website. 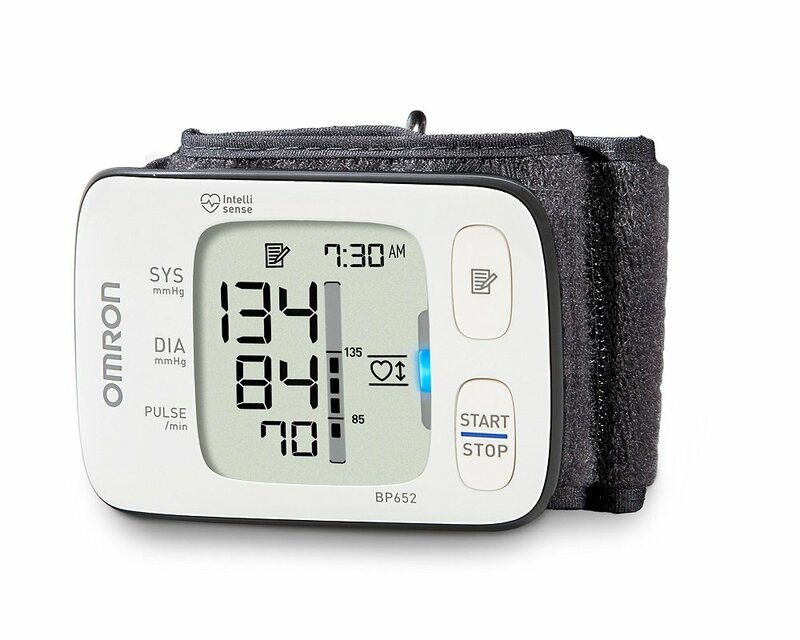 Omroms BPM kit takes full advantage of technological developments, letting you connect through Bluetooth to its incredible iOS and Android apps to keep track of your blood pressure. Multi-color light indicators will show if your readings is in the normal (green) or hypertension (orange) range, so this is very easy to understand and it lets you know straight away if you need to call the doctor. Two users can store up to 100 readings in the machine itself, while you can use the app for unlimited readings. It also has a BP cuff that goes over the entire arm in order to ensure that your arm is in the correct position for a good measurement. Best of all, it automatically takes 3 different readings one minute apart and gives you the average, as is recommended by the American Heart Association. For those who don’t mind using the app, this is one of the most convenient and well-made blood pressure kits we’ve seen. This is the next generation of blood pressure kits lets you get measurements easier than ever as you simply strap the machine onto your wrist to get your reading. As such it is quick and easy to use at all times. This BMP monitor gives you systolic and diastolic blood pressure readings along with your heart rate. 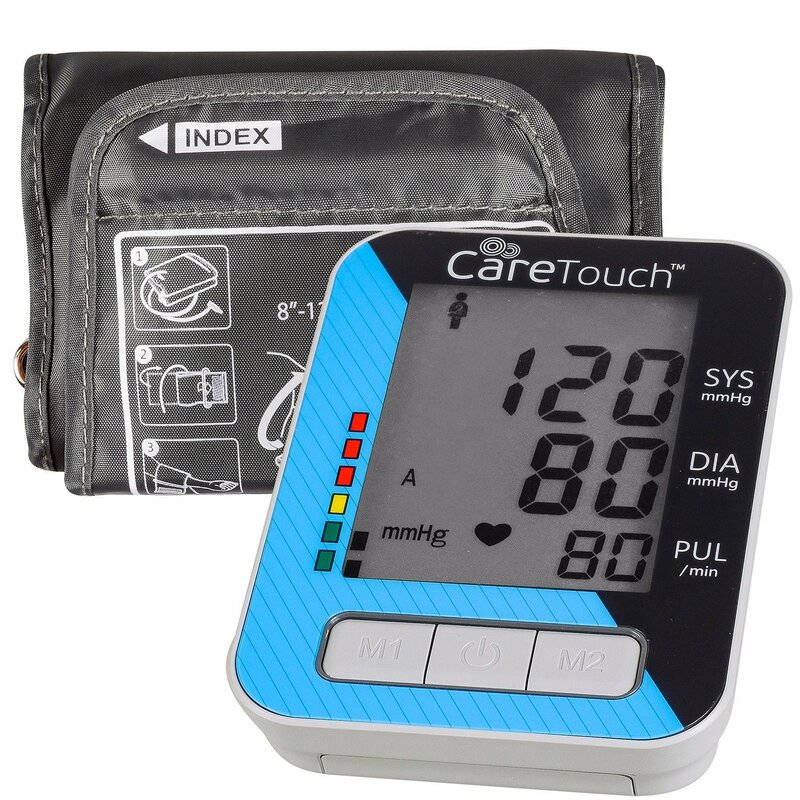 This digital blood pressure device has an advanced measuring technique that gives you not just the fastest reading method but more importantly the most accurate one. The only downside to this blood pressure machine is that it only stores your last reading, so you’ll need to be very vigilant about keeping a journal or your tests. The Panasonic EW3109W is one of the finest portable BP monitors on the market, and it lets you take BP readings anywhere you like. It has been developed with a special Digital Filter Sensor detects and isolates only the essential pulse oscillation, so it cuts out any interference in order to give you very accurate numbers. It has also been specially designed for home use, with one touch inflation functions and a large and clear LED monitor to let you see the results. Flashing numbers will also warn you of hypertension. This is a wonderful, easy to use BPM machine. 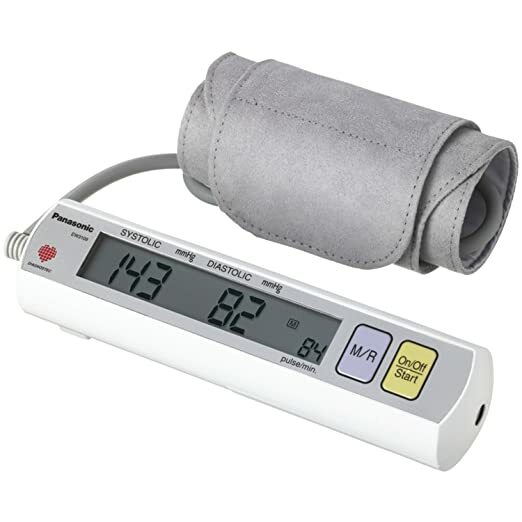 This FDA-approved Aneroid Sphygmomanometer is one of the best affordable blood pressure testing machines on the market. Each kit is stress-tested over a thousand times to endure that they are accurate and durable. The cuff has been specially constructed to meet medical regulations, and it is resistant to chemicals, abrasions, and moisture. 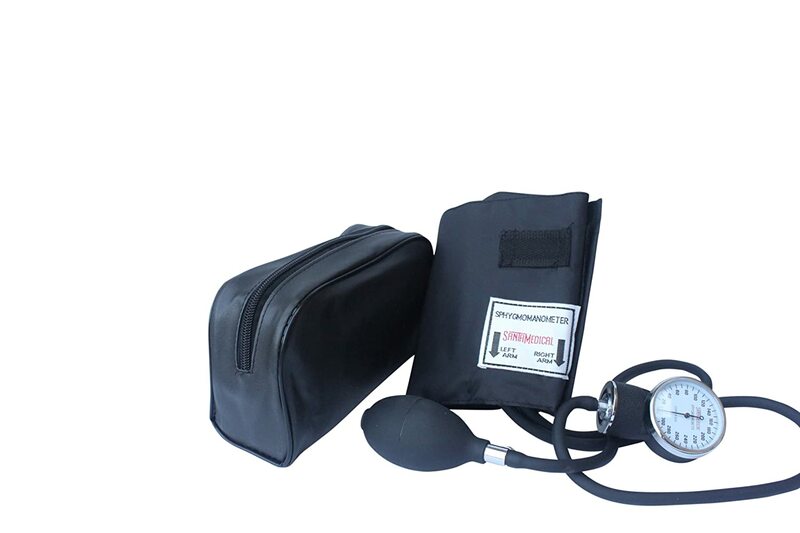 Despite being made of such high-quality materials and giving precise measurements, this kit is surprisingly affordable, and if your doctor has asked you to monitor your own blood pressure, you can’t go wrong with this. Onrom’s wrist monitor is a brilliant medical product that every home should have. Simply slip it on your wrist, touch a button and you are ready to go. Better still, it is no compact and portable that you can take it with you anywhere you go, and its silent inflation will even let you use it at work in in school. It also immediately alerts you to unsafe readings or abnormal heart rates. Best of all, it can store up to 100 previous readings, so you don’t have to worry about recording them yourself. Simply take this to your doctor’s appointment and show them the figures. If you are looking for a small and compact monitor that you can take with you wherever you go, this might be one to look into. 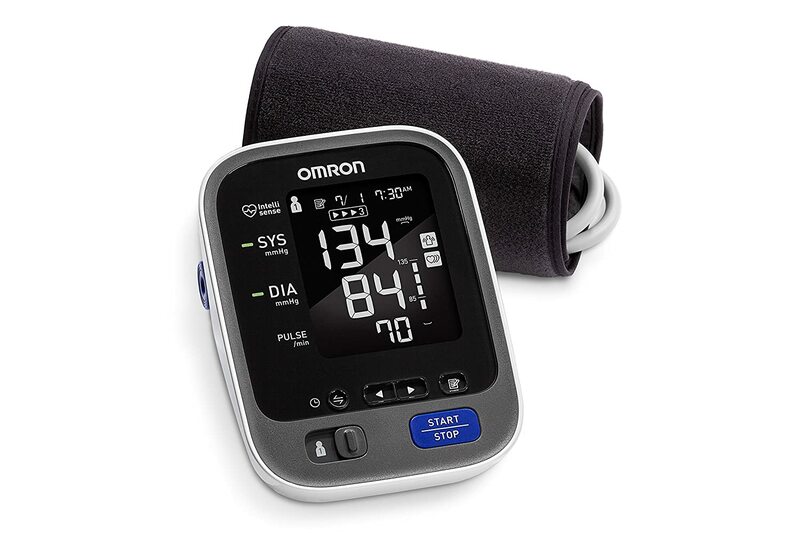 We recommend the Omrom Blood Pressure Monitor as our top pick, simply because of the convenience of using the Bluetooth app to store unlimited readings. It just takes so much effort out of having to record readings by hand or keyboard and keep the journal for your doctor. Also, the app ensures that the monitor is slim and sleek, so it is very portable and easy to take with you in case you want to take readings while on holiday or in the office. If you’re on a tight budget, the Santamedical monitor is very affordably priced, and although it is a little more old-fashioned than some of the other monitors we’ve looked at (call is classic if you will), it is still a great piece of kit that is going to give you very accurate and useful readings that you can share with your doctor and help them properly treat your condition. Wear loose-fitting clothes and a T-shirt or sleeveless top. Don’t take the best if you need the bathroom; go to the toilet first. Once you are ready, sit upright in a position where your arm is supported at the cuff and at the same level as your heart. Putting your arm on a cushion is good for this. Keep your arm relaxed and don’t tense up, and keep still and silent once you start the test. Always use the same arm for your blood pressure tests, as changing the arms can upset the consistency of the readings. It’s also a good idea to do around 3 readings and take the average. Also, remember to write the readings down on paper or on your smartphone – it’s so easy to forget. Always record the readings exactly as they are, and inaccurate readings aren’t going to do your doctor any favors and can result in you not getting the proper treatment you need. What to the Readings on the BPM Machine mean? 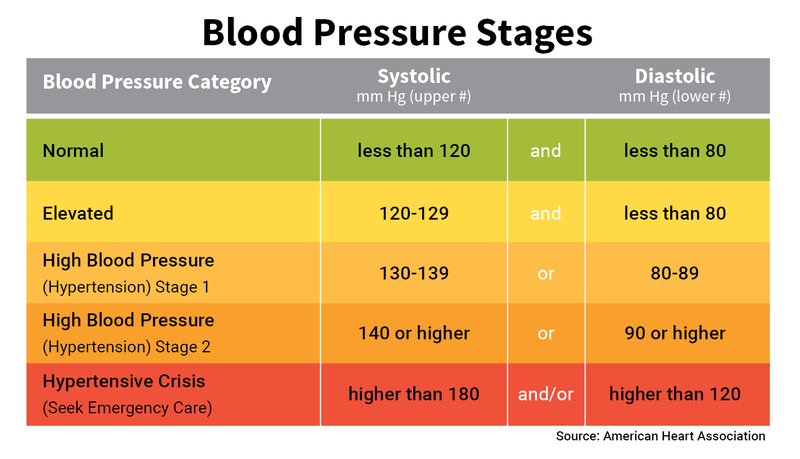 The following table will show you how to understand the numbers after testing your blood pressure.